I like to do things fast. Knock them out quickly. Before I get scared or tired or bored or distracted. This morning, in need of some reliable wifi and peace to work on homework, I drove into Taos. It was only 24 miles but took me a good 45 minutes. You have to move slower when the road winds and twists and turns and the other side is a steep drop off. Down a giant mountain. Most of the drive is a no passing zone. You can’t see down the road far enough to get out ahead. You are just stuck. Winding and turning. And following the advised speed limit or the car in front of you. Occasionally feeling your stomach lurch with another turn. It is easy to not care about the time because it is so damn beautiful. My husband is all about the mountains. He breathes easier in this thin air. I am a water girl. Give me a beach or a paddle board and I am in my happy place. Even if I have to put on a swimsuit. I get how much easier it is to feel alive here. My kids drop their devices and play in the snow until their toes and noses are numb. I stare out the window instead of down at my phone. I read by the fire. My son skis just like these mountain roads. He uses the whole mountain. He goes slow and cautiously back and forth. Winding and turning taking his sweet time. Because really what is the rush? And truth be told I like to keep him in one piece. My daughter is more likely to point her skis into French fries and head straight down. I learn from watching my kids all the time. I learn who I was and who I am from the parts of me that I see in them. Genetics is so much more than my daughter having my freckles across her nose and my smart mouth. I also see so much of me in their questions, reservations and insecurities. They are often mine. I see my daughter rush and fight and resist. I see my son wind carefully down. These days it all seems a bit slower. My brain moves at a different pace. I run slower. I do less. I sleep more. There is frustration in that. Seeking a balance between what I know I shouldn’t do and will pay for with pain for days later and still living my life. Finding a difference between good healthy decisions and things that are worth the risk. I am sure that is probably a skill most people master by the age of 22, but it is still something I am working on. on the mountain. ( I have papers to write). I try not to mind. On Saturday I ran a race. Well…I slowly jogged a race. I told almost no one. I got in the car – headed there –changed my mind went all the way home and then changed my mind again and got back in the car. I was crazy nervous. I used to run 5Ks as my warm up, but I wasn’t sure I could finish. I have never not finished a race. The fear of not finishing almost made me not even start. Ironically the big inflatable starting gate was backwards. The first words I saw when I lined up to begin was “finish”. I also cried for the first half mile. I was glad that it was raining a little so no one could notice. It is something I love and haven’t been able to do in well over a year. Slow and steady. Paying attention. Glad for my shortness of breath and stitch in my side. It probably wasn’t my best idea. My face went numb halfway through. It was my worst time ever – but after 3.1 miles I ran through a huge inflatable “start”. And I couldn’t have been more ready for a new one. 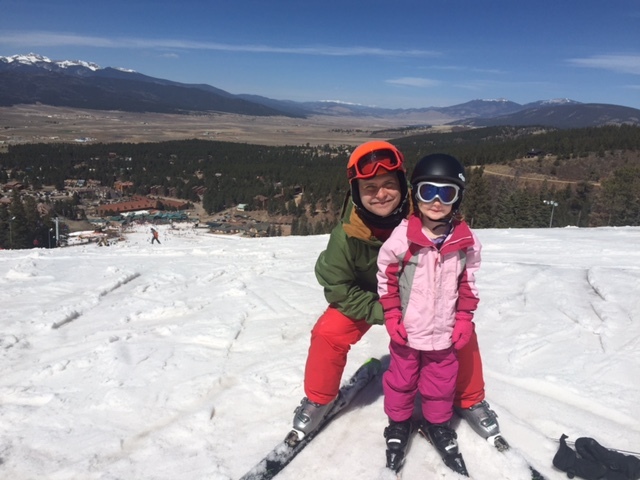 This morning my daughter asked if I had ever skied (even though I skied with her just last year). This before and after that seems to separate so much of my life. I’ve started making dumb decisions. That involve living instead of protecting. Tomorrow I think I will hit the slopes. I need to feel that alive. I need my kids to remember me there. I need my knees to ache and my cheeks chap from the wind. I need to make my way down the mountain just like my son. Slowly. Carefully. Using the whole mountain. Soaking it all in. I worry that I won’t be able to make it down or get my money out of my lift ticket. I worry about the pain that it might leave me in. In a few hours I will drive back on those same roads. Windy. A little dangerous. And slower than I usually drive. I can’t see what is around the turn. I have no idea if it will hurt or be fine. I just have to go. I will crank up my music. And soak every damn bit of it in.